Making Quadram Institute science accessible to industry. Welcome to Innovation and Impact at Quadram Institute, your first step to accessing the scientific assets and technology that will add real value to your business. We bring our knowledge and stringent, clinically tested strategies to industries that share our goal: to improve human health and wellbeing throughout life. Working across four themes: the gut and the microbiome; healthy ageing; food innovation; and food safety, our Quadram Institute scientists retain the pioneering spirit of our legacy institutions. Utilising the unrivalled technical, clinical and medical resources available, including the Norfolk and Norwich University Hospital endoscopy Department, the new Quadram Institute is a hub of innovation. It is at the heart of the Norwich Research Park, a thriving environment of world-class institutions such as the John Innes Centre. With industry partnerships, we are uniquely positioned to tackle the major health challenge of our generation. People are living longer, but they are not necessarily living healthier. Food-related illnesses cause more than 350m deaths each year globally. Diet is now the number one cause of death and ill health in the UK, even ahead of smoking. In 2016, the BMA declared poor diet has the highest impact on the NHS, costing around £6 billion per year, greater than alcohol consumption, smoking and physical inactivity. Chronic, diet-related disease costs the UK £5.1bn each year in direct health costs – and about £16bn to the economy. NICE estimates this economic cost will rise to £50bn by 2050 if no action is taken. Quadram Institute industry partnerships are tackling this head on. We work collaboratively to translate our science to benefit patients, consumers and society. The impact of diet on disease is well documented. QI goes further. We are incorporating food structure and personalized treatment into the next generation of health solutions. Our team of scientists and clinicians are working to understand how food can maintain and promote health and healthy ageing. 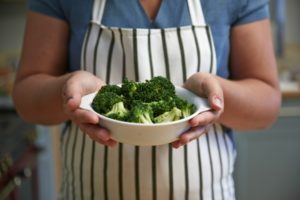 Beneforté or “super” broccoli is a non-GM, enhanced food with three times the level of glucoraphanin of normal broccoli. This compound is known to reduce LDL cholesterol and is now being tested to assess its impact on prostate and other cancers. Success so far: Beneforté broccoli is on sale throughout the US, EU countries and leading UK supermarkets. Cardiovascular disease risk, prostate and breast cancer, osteoarthritis prevention and reducing blood glucose for those at risk of Type 2 Diabetes. Humans are hosts to a rich community of microorganisms that are vital to our health and play critical roles in a range of diseases. Our cells interact with this microbial community – the microbiome. It’s an exciting new area of research, where we are focusing on its use for industry to improve human wellbeing. A pilot scheme between the IFR and the Norfolk & Norwich University Hospital to treat patients diagnosed with recurring C-difficile infection using Faecal Microbiota Transplants (FMT) has had a 90% success rate. What’s next? : We are at the forefront of investigating FMT’s potential role in new treatments of other gastrointestinal diseases, such as IBS, IBD and Crohn’s Disease. The story so far: Food poisoning costs the UK economy £1.8bn a year. To reduce this, we have made great advances in microbiological food safety through technological advances in genomics, mathematical modelling and quantitative risk assessment. Ask us about harnessing new genomics technologies and big data management to trace outbreaks from their origins in the food chain. 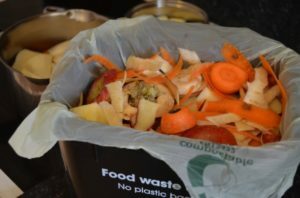 The UK throws away £13bn worth of food each year, a figure exacerbated by products’ ‘best before’ and ‘use by’ safety dates. Working with the Chilled Food Association, BBSRC and Unilever, our science investigated the effects of heat processing on pathogens, specifically Clostridium botulinum – an FDA ‘bad bug’ – to keep our food fresher and safer for longer. Ask us how this collaboration has brought modern quantitative risk assessment with legislative consequences into the expanding prepared food sector – keeping our food fresher and safer by moving away from traditional approaches. In 2013, a Top 5 UK supermarket lost £300m off its share price when horse meat was discovered in its beef burgers. Increasingly complex supply chains make food hard to trace but with operational costs, restocks and reputation damage included, one product recall can cost £1m1. 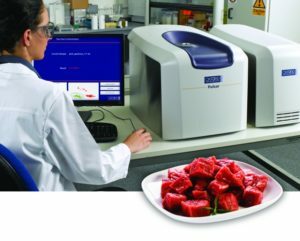 Our partnership with Oxford Instruments faced the issue of consumer trust head on by enabling cheaper, quicker meat speciation testing for industry. Pulsar is the industry-leading, affordable, desktop way to check meat products are exactly what they say on the label. Different meat species exhibit different fatty acid profiles, and these profiles can be used to identify the meat species being tested, generally in less than 5 minutes. Ask us how we are Improving consumer trust through scientific and medical innovation and partnerships.